Steampunk superheros in Victorian-era New York! The Society of Paragons is gone--destroyed from within by traitors and enemies. With the death of The Industrialist and the rebirth the Iron-Clad as a monstrous half-human creature known as "The Shell," Lord Eschaton now has almost everything he needs to cover the world in fortified smoke and rebuild it in his image--everything except for the mechanical heart of the Automaton. The device is nearer than he knows. Just across the East River, hiding in a Brooklyn junkyard, Sarah Stanton is trying to come to restore the mechanical man to life. But before she can rebuild her friend, she must first discover the indomitable power of her own heart and save herself. Only then will she be able to forge a ragtag group of repentant villains, damaged Paragons, and love-mad geniuses into the team of heroes known as "The Society of Steam." "Written with the sort of breathless, excited narration you'd expect from a Victorian adventure novel. . . . A damn fun read." "If Stan Lee had lived in the 1880s, this is the book he would have written-steampunk superheroes." "After the breathless beginning, the book keeps moving fast and furious, and it delivers. . . . 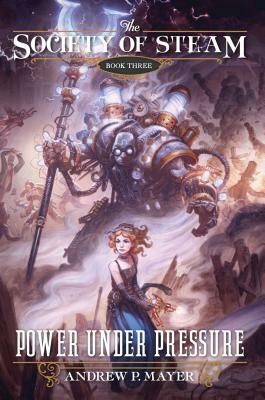 Highly recommended for any steampunk lover."